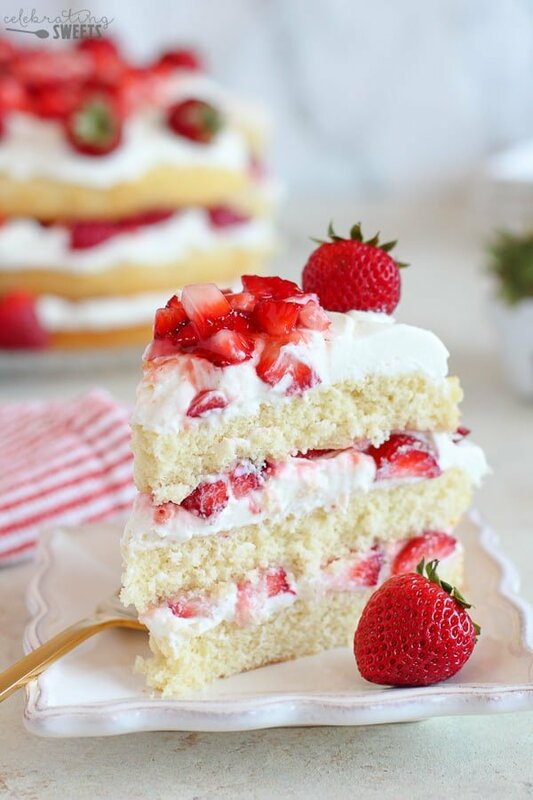 What tastes like a strawberry shortcake, looks like a beautiful layer cake, and is sure to impress anyone and everyone you serve it to? If you’ve been around these parts for a while you know that I absolutely love baking with strawberries (I kinda like drinking ’em, too). During spring and summer, there are always strawberries in our kitchen. 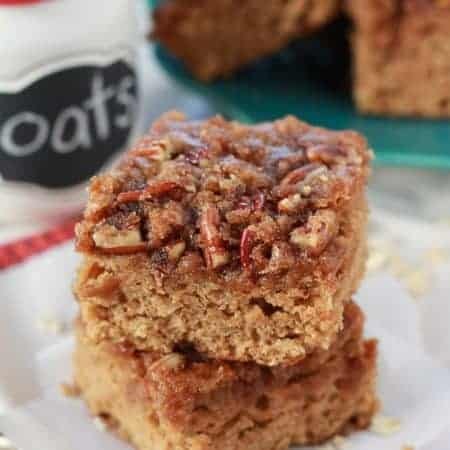 They are my favorite fruit to bake with, and they go well in so many recipes. 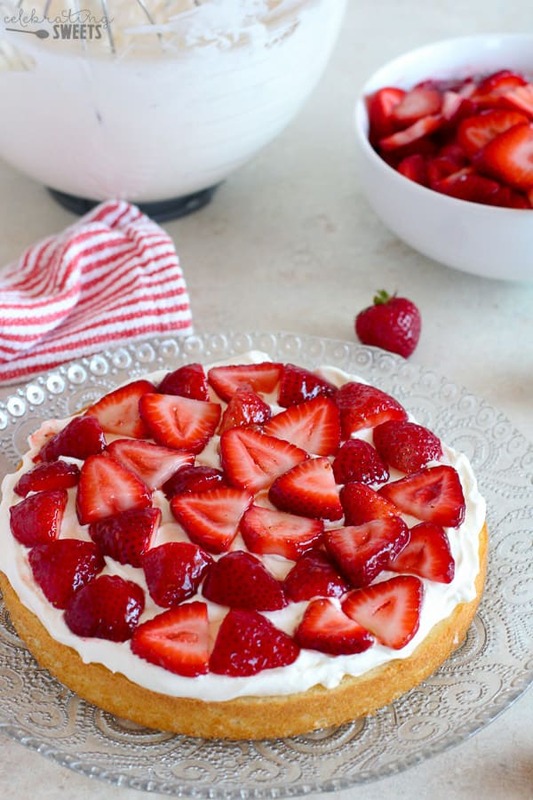 I’ve had a Strawberry Shortcake Cake on my summer “to-bake” list for years. My goal was to come up with a cake that had all the flavors of strawberry shortcake stacked high in a gorgeous layer cake. My main criteria were that the recipe needed to be fairly easy, completely from scratch, and it needed to taste AMAZING (duh). I fully expected to have to play around with this recipe multiple times until I got it right, but, somehow this came out perfect – just the way I wanted it – on the first try. Vanilla Cake: I made three layers of a fluffy (almost sponge-like) vanilla cake. The cake layers are light, yet sturdy enough to hold our filling and topping. If you’d prefer a two layer cake, you can bake the cake in two pans, rather than three. Your layers will be slightly thicker than mine. 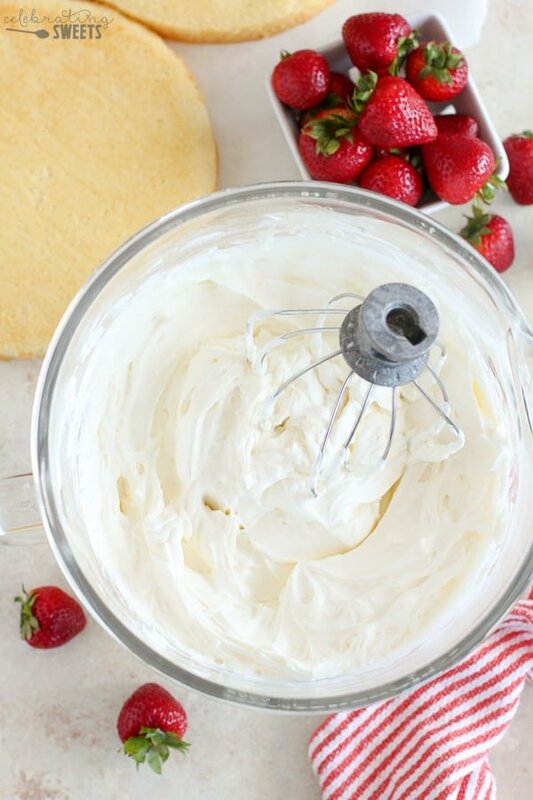 Stabilized Whipped Cream Frosting: Strawberry shortcake has to have whipped cream (and not the kind in a can or that questionable whipped topping in a tub). 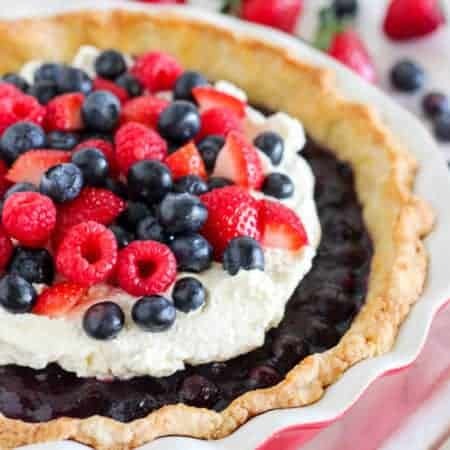 This is the real deal – freshly whipped cream, lightly sweetened with powdered sugar, and flavored with a touch of vanilla. In order to keep our whipped cream firm, I also add cream cheese to it. This stabilizes the cream and helps it hold its shape. You will have enough frosting to frost the sides of your layer cake, if you desire. I like the rustic look of leaving the sides exposed. Strawberries: Find the best strawberries you can and toss them with some strawberry jam (this makes them glossy and sweet). 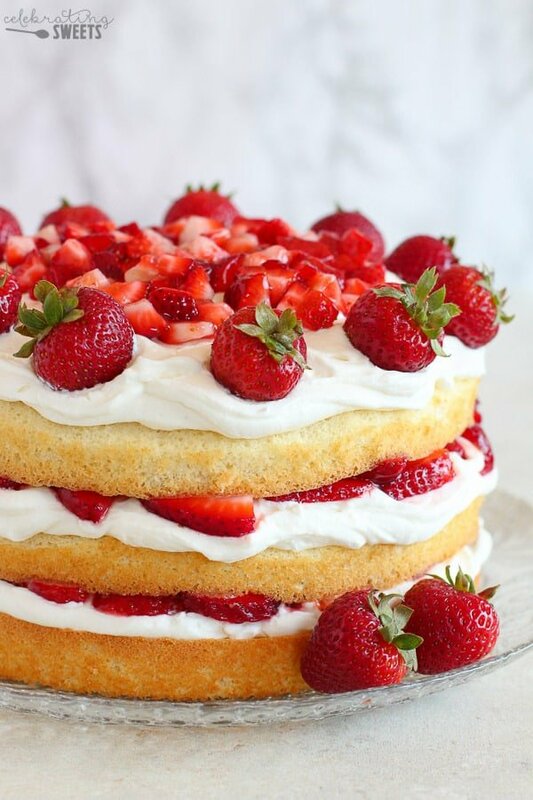 Strawberries go in between our cake layers, as well as on top of the cake. You can decorate the top of the cake however you like: I used a combination of diced strawberries and whole strawberries. 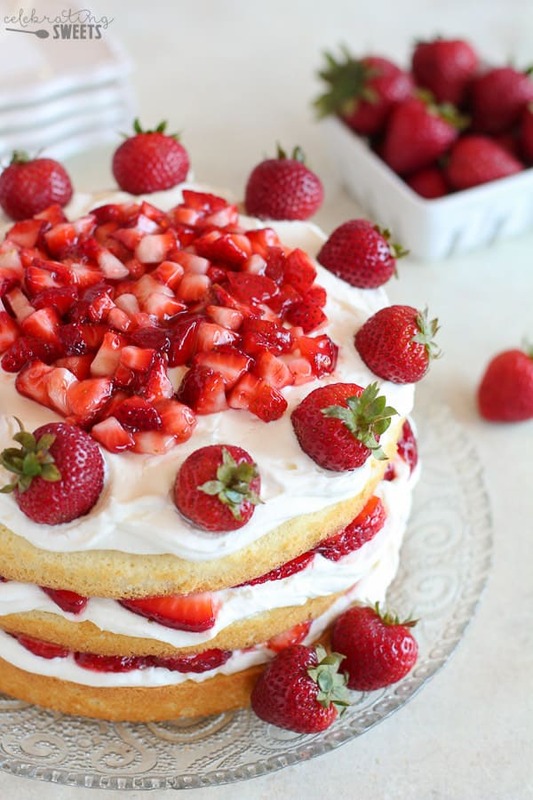 I used thinly sliced strawberries for layering in between the cake (see below). What I love about this cake is its versatility. It’s pretty enough to be served at a dinner party, yet casual enough to be part of a summer BBQ. If you know someone with a summer birthday, this cake would be extra pretty studded with candles and served to your loved ones. However/whenever you choose to make it – just make it! Grab those beautiful summer strawberries before they are gone. Preheat oven to 350°F. Line the bottoms of three 8-inch round cake pans with a circle of parchment paper, and spray the pans with nonstick spray. Set aside. In a small saucepan, bring the milk and butter to a boil. 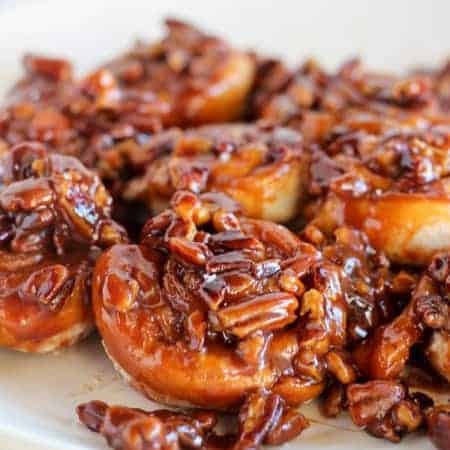 Once boiling, immediately remove from the heat and add the vanilla extract and almond extract. In a separate bowl, using a hand mixer or stand mixer, beat the eggs and sugar until pale yellow, fluffy, and doubled in volume. This takes about 5 minutes - do not skip this step, this helps to make the cake fluffy. While still beating, slowly drizzle in the hot milk mixture. Beat in the flour mixture. Divide the batter between the prepared pans (I use a generous 2 cups of batter per pan). Bake for 14-18 minutes, or until the edges are light golden, the center springs back when lightly pressed, and a cake tester comes out clean. I recommend rotating the baking pans at least once during cook time. Set the pans on a rack to cool. Run the tip of a sharp knife around the edges of the cakes to loosen them, and turn them out of the pans (the layers will be fairly thin, about 1-inch high). Combine the strawberries and jam and set aside (these will be used for the filling and topping). Note: I sliced the strawberries for the filling (about 2 1/2 cups), and I diced the strawberries for the top of the cake (about 1/2 cup). Do both, or one or the other - your choice. You'll need about 3 cups total. For the whipped cream frosting: Combine the cream cheese, powdered sugar, and vanilla extract in a large mixing bowl or the bowl of a stand mixer. Fit the mixer with the whisk attachment and mix on medium speed until smooth. While the mixture is still whipping, slowly pour in the heavy cream down the side of the bowl. Stop and scrape the bottom and sides of the bowl periodically. Increase the speed and continue whipping until the cream can hold a stiff peak. Assembly: Place one layer of cake on a platter. 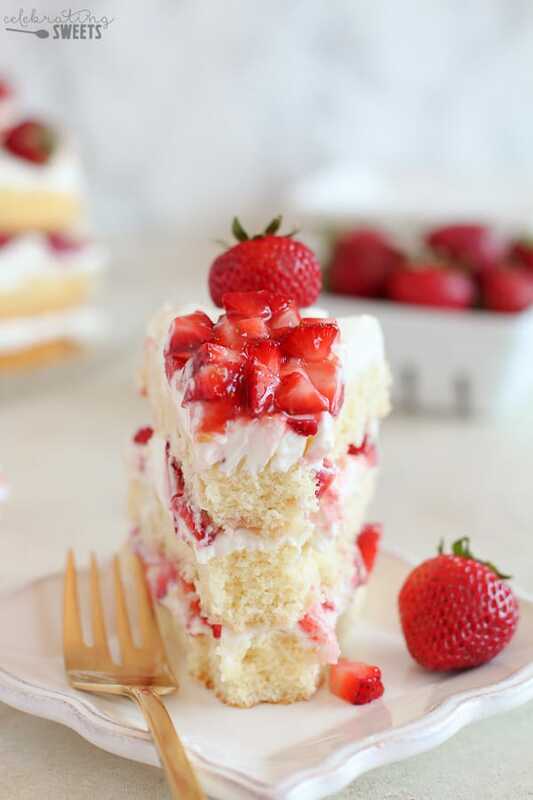 Top with whipped cream frosting, then top with about 1 1/4 cups of sliced/diced strawberries. Place another layer of cake on top and repeat. 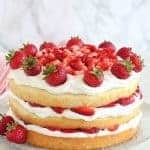 For the third/top of layer of cake, top with whipped cream frosting, then place the remaining diced/sliced strawberries in the center. Decorate the outside with whole strawberries, if desired. I like to store this cake in the fridge to keep the frosting stable. Note: There will be enough whipped cream frosting to coat the sides of the cake, if you desire. I chose to leave the sides exposed. Any extra whipped cream frosting makes a great dip for fruit. I must comment… excellent cake and easy. The key is not to over mix and the cake came out perfecto. The only thing I left out was the jam bc I didn’t think the strawberries needed it. I bake all the time and I loved how fresh and simple this was. We had some left over for the next day but this is best to devour the day it’s made. Thank you! I’m making it again tomorrow. Hi, Natalia. Double might make the cake layers quite thick. Maybe 1.5, although I have never tried it. The other option would be to make the recipe was written, but only use TWO 9-inch pans. Your layers will be a bit thicker than mine, but not as thick as if you doubled it. Enjoy! Can you make the cake And frosting a head of time and store separate in frig until ready to make? Yes. Make sure the cake is tightly covered so it doesn’t dry out. If the frosting thins out you can whisk/beat it briefly to thicken it again. Enjoy! Hi was wondering if you can make it ahead and freeze the layers until ready to put together? Yes, you should be able to freeze the layers of cake (unfrosted) until you’re ready to use them. Enjoy! Thanks can’t wait to try recipe tomorrow. Can I use room temperature butter and warm milk? Does it have to be boiling? I’ve only ever made it the way it is written, which is to bring the butter and milk to a boil. This is what gives it the “sponge cake” quality. You can try MELTED butter whisked into warm milk, but I’m not sure how the temperature difference will affect the final result. Enjoy! Does this cake need to be refrigerated if made a day ahead? Not fully assembled yet, just the actual sponge cake. The cake itself does not have to be refrigerated, although it might be easier to work with if it is chilled. Once the cake is assembled serve immediately, or place in the fridge for a few hours and bring to room temperature before serving.